At Paul Adams we continually strive to meet the highest standards and for that reason it is essential we employ the highest standard delivery team. We use all our own dedicated staff and ensure that every member is expertly trained. All our team are full time and have a wealth of experience. We will always endeavour to keep your delivery day as pain free as possible. For this reason we have a fully free of charge delivery service spanning over a 50 mile radius. We also narrow our delivery day times down to morning or afternoon, ensuring your whole day is not lost. All you need to do is look out for the Paul Adams van and then relax in the knowledge that your furniture is being delivered by safe hands. When you buy furniture from Paul Adams, we will ensure that your purchases reach you quickly and safely with our Premium 'white glove' delivery service. Our own two man specialist delivery team will deliver your order, take it to the room of your choice and fully assemble the furniture. They will demonstrate the product for you and check everything is as you want it. They will even take the packaging away with them, it's all part of the service. 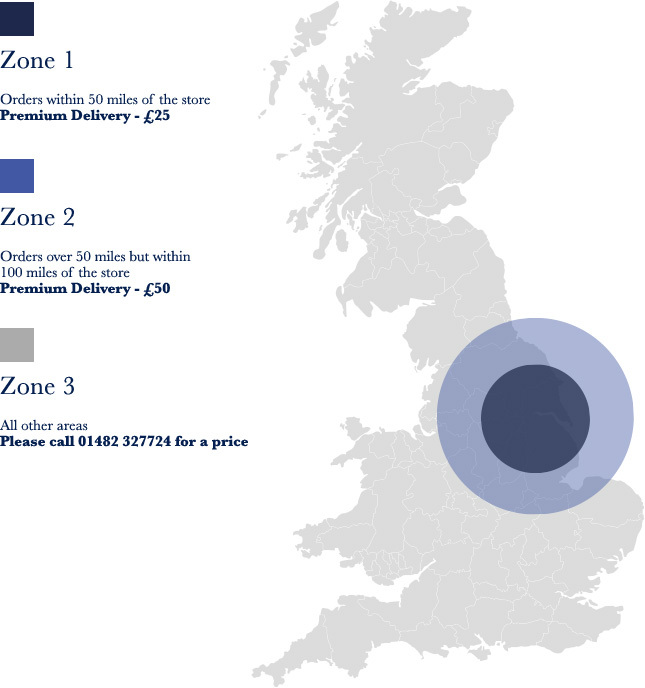 Premium delivery service is charged at a flat rate of £25 within a 50 mile radius of the store, and at a £50 for deliveries over 50 miles but within 100 miles of the store. For deliveries to all other areas please call Paul Adams on 01482 327724 for a price. Estimated delivery times are made in good faith, based on information received from our suppliers. The company cannot be held responsible if the dates are not upheld. Once the items arrive we aim to deliver your furniture to you within two weeks, but in most cases within a week. We can offer a morning or afternoon delivery slot. It is the customer's responsibility to make sure that the furniture they select will fit into their home and that access is sufficient to execute delivery. For peace of mind we offer a home site survey to check access to the property and that your furniture will fit. Please contact the store for details. Any structural alterations to the property such as removal of windows, doorframes, or labour to gain access for the delivery will be the responsibility of the customer. Please make us aware of any unusual situations, such as traffic restrictions or internal lifts or stairs. It is always helpful and will enable us to foresee and overcome any delivery problems. If a delivery is missed or is un-successful, a re-delivery fee may be charged. If you have chosen to collect your furniture, please contact the store prior to collection to check it is in stock and available. Some items may have to be transferred from our warehouse so may take time to get to the store. Please check the opening times to save a wasted journey. To avoid any delay when collecting your order, please bring a copy of your order and some identification. We also offer a furniture disposal service - please see below. We do offer a service to take your old furniture away on a like for like basis for a small fee of £25.00, however as it is our company policy to ensure where possible old furniture and packaging materials are recycled and we like to encourage our customers to donate their old furniture to local charities of their choice.